Then one day, with an unexpected meeting with a girl named Chitoge Kirisaki, the daughter of the Beehive mafia leader, Raku and Chitoge found each other butting heads. And with a twist of faith, both of their fathers have set them up as a fake couple to ease the tension between rivaling faction. Before I begin, there is a good chance Nisekoi is going to be a love or hate anime. Why? Because Nisekoi is a harem romantic comedy with all the cliché refine and beautifully animated. So if you absolutely can't stand cliché and tropes, then everything great is everything bad for you. The Story - The story takes one of anime and manga most common romance trope, a faint memory of a childhood friend and a clue to the girl's identity, which in this case is a lock pendant and a key. Like many harem anime, you often find yourself cursing the writer for sabotaging the girl that is clearly meant to be with Raku. But despite your frustration, the comedy and episode that show some development for the girl you think should be victorious, keeps you coming back for more. The Characters - Despite their initial appearance who seemly rely on their stereotype, the characters do grow and more often than not, you'll see more of their dere side than their other shell. On top of that, by appealing to their dere side, they slowly but do make breakaway from their stereotype. However Raku is probably the weakest in character development out of the entire cast. He fits the typical harem guy to the T.
The Comedy - It has all the comedy you'll expect from a harem romantic comedy anime, miscommunication. So why is this under great? Because of execution. The timing and expression really gives the comedy a kick despite knowing the punchline. 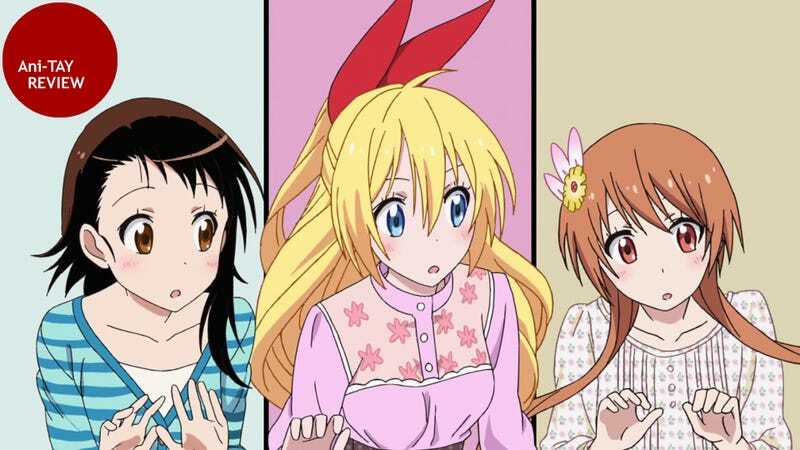 The Animation - One of the strongest point of Nisekoi is the animation. Nisekoi has an incredibly colorful animation and spare no expense on all the main cast girls' glorious hair. The animation also ties back to the comedy, as the style can shift to fit the comical mood. The Endcard - At the end of every episode, the anime has a nice artwork that make excellent wallpaper. The Ending - By no mean does this make Nisekoi bad, in fact, it's because it's good that the ending is bad. Like many anime that follows closely to the manga, there isn't always a clean cut arc or good point to end the anime. Nisekoi ends rather abruptly in order to leave room for the manga to either get even further for possibly another arc or for the manga to end. However, this also leaves a lot of room for a season two. As with many childhood friend anime/manga cliché story, the hook is the mystery, the meat is the comedy, and the bone being the girls. Despite all the red herring, self-sabotage, and fate intervention, the comedy and the girl you're rooting for keeps you coming back for more. If you're still unsure, and in need of a second opinion, check out Richard's review over at Kotaku.